Zagats National Restaurant Review #1 in décor in USA and one of the Top Japanese Restaurants in Colorado 2008! Summer is officially here and the days are warm and long. Dining on the patio is popular in the summer at Domo and many customers arrive for dinner as the sun begins to go down later in the evenings. To accommodate all of our customers, we are encouraging folks to come a little early with an EARLY BIRD SPECIAL for customers seated from 5:00 pm. to 6:00 pm. A complimentary small sake, beer or soft drink is included with all dinner orders as well as an ample order of edamame for your table! Domo Restaurant accepts reservations for parties of six or more and parties under six are seated on a walk in basis. Our patio is quite popular in the summer, and while every attempt will be made to seat you on patio should that be your request, garden seating cannot be guaranteed. Denver is famous for sudden summer thunderstorms which can occur without notice. Domo Restaurant offers indoor, outdoor and covered patio dining, and in case of a sudden rain shower we will do our very best to re-seat you indoors as quickly as possible. If however the restaurant is full, it is very difficult for us to guarantee immediate indoor re-seating. Domo Restaurant cannot be responsible for weather interruptions of your meal. We welcome you to join us on our patio, but want to make sure you are aware of our limited seating capacity should sudden weather occur. Thank you for your patience and understanding! The indoor outdoor dining spaces at Domo are designed to blend together, and most often the doors from the dining room to the garden remain open so that our inside diners may enjoy the special ambiance of the garden as well. For this reason, Domo has only limited air conditioning and relies on the natural breezes from the garden to keep things cool. For our indoor customers, we also have traditional Japanese hand fans, and if you dine in the garden, rice straw hats are available for all of our customers to shade them from the direct sun. These are two Domo ideas to keep the summer a little cooler, save energy and remain ecologically mindful! So please bear with us, the fans and hats can add to your Japanese traditional dining experience! New Bamboo Chopsticks at Domo! You might have noticed that Domo has changed its chopsticks. We are now using chopsticks made from bamboo and are about an inch and a half shorter than other wooden chopsticks used in Japanese restaurants. This small yet significant change is another effort by Domo to save resources and save trees! Bamboo chopsticks are more expensive, but are a readily renewable resource and we feel the investment in our planet is worthwhile! In Japan, the amount of wood used for disposable wooden chopsticks in one year is enough wood to build 20,000 homes. This is the amount of wood that is thrown away each year in Japan alone and is multiplied by the use of wooden chopsticks in other countries like the USA. At Domo we pride ourselves in tradition but also look to our future. We are always looking for ways that we can contribute to the environmental health of the world we live in. Westword Best Japanese – 12th Consecutive Year! 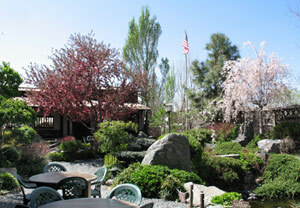 Once again, Domo Restaurant was voted Westwords Best Japanese Restaurant 2008 — for the 12th consecutive year! Domo is proud to be recognized for our high-quality menu, and continues to deliver consistent, delicious food year after year. A very popular and nutritional favorite during the summer in Japan are chilled soba noodles (buckwheat noodles). On hot summer days, chilled soba is a refreshing lunch dish. At Domo, our chilled soba is tossed with seaweeds and mountain vegetables and served with a delicate shiitake mushroom and light soy sauce dipping sauce. Finely chopped green onion, nori seaweed and wasabi are provided as garnishes to suite your taste. For a heartier fare, a special side order of chicken teriyaki is available. Domo's Miso Shiru is #1! In the United States, most people do not know what miso shiru truly is. In the US, miso shiru is sometimes called simply “miso soup” or I have even heard it referred to in high level Japanese restaurants as just “miso”. I think the true appreciation for miso shiru has not been communicated properly here in the USA, evidenced in part by the fact that it is incorrectly referred to by a number of different names! Real miso shiru soup stock is made from dried kombu (kelp), dried shiitake mushrooms or dried niboshi (dried small sardines). Our chefs at Domo start by preparing the soup stock fresh and from scratch daily, adding many different assortments of vegetables to enhance the flavor of the miso shiru of the day. In Japan today, an incredibly wide variety of international cuisine is available to the Japanese people, but still at the heart of all Japanese meals is a bowl of steamed white rice and a bowl of miso shiru. Miso shiru is a most important dish (not just a soup) and part of any meal; breakfast, lunch or dinner. I wonder what kind of experiences you have had enjoying miso shiru in other Japanese restaurants in the US. How was it? Was it a thin soup with a few tiny cubes of tofu nestled at the bottom of the bowl and sprinkles of wakame seaweed floating on the top for decoration? This I am afraid is the experience that many Americans have had with miso shiru here in the United States. At Domo we are very stubborn in keeping the rich traditional recipes for miso shiru alive. As a special ingredient, Domo begins its soup stocks by boiling fresh chopped daikon radish and cabbage for at least an hour before the shiitake mushrooms or kombu or niboshi are added to make the stock. This makes for a delicious, mild, soft quality to the broth. After the broth has simmered for at least another two hours, miso paste is added along with healthy portions of wakame and funori seaweeds, enoki mushrooms, shimeji mushrooms, carrots and a variety of other daily ingredients to make each days miso shiro a special Domo dish. This kind of miso shiru can only be found in Colorado at Domo Restaurant. Every dish on the Domo menu (excluding soup or broth based pot dishes) is served with a fresh bowl of this rich and delicious miso shiru. Please take an extra moment to enjoy Domo’s healthy, traditional and delicious miso shiru with every meal served at Domo! Domo Restaurant is once again first in Denver to offer our guests an On-Line Guide to Domo’s famous country side dishes. Come explore the history, folklore, ingredients and health benefits of over twenty of Domo’s favorite traditional side dishes. Click here to view the Online Guide. Every month Domo holds a drawing for a $50.00 gift certificate to Domo for our customers who participate by filling out a customer experience questionnaire. Check the Domo website at www.domorestaurant.com to see if you are this month’s winner! MondaySaturday: 11:00 a.m.  2:00 p.m. and 5:00 p.m.10:00 p.m.